When the Supreme Court removed the last barriers to corporate funding for political campaigns in the infamous Citizens United vs. Federal Election Commission case in early 2011, the floodgates were opened for corruption in an electoral system already marred by electronic vote scamming and huge ballot access hurdles for candidates in third parties. Now, a case involving Republican presidential candidate Mitt Romney is sparking investigations, because a shell company was formed by one of Romney’s cronies just long enough to pump $1 million into his 2012 White House campaign before the company was closed down. “Why should a corporation be able to do it and not have it be considered illegal?” Carl Person, a New York attorney and a 2012 presidential candidate for the Libertarian Party, told this reporter. If Conrad had contributed $1 million as an individual person, “he would have had to report it as an individual to the [Romney] campaign,” said Person, which then would have to “report it to the FEC.” That would be illegal. Romney, who changes positions on many issues like some people change their socks, is clearly of the genus corporation man. He was immersed in the world of business with Bain, while sitting on the boards of directors of other firms, until about 10 years ago before taking a political trajectory—much like that of his father, former Michigan Governor George Romney, who was an auto executive before going political with an internationalist, pro big business bent. 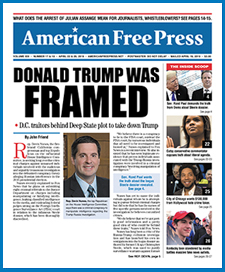 Mark Anderson is roving editor for AMERICAN FREE PRESS.